Ascend 60 feet and uncover the secrets of Britain’s largest painted ceiling. Painted between 1707 and 1726, the Painted Hall at the Old Royal Naval College hides many surprises. Currently undergoing a major conservation project, this is a once-in-a-lifetime opportunity to experience the drama of this vast baroque masterpiece up close. Take an hour long ceiling tour via a special observation deck and discover the painting’s mysteries as they are revealed for the first time in half a century. The tour is delivered by an expert tour guide who has been trained in audio-description by Vocaleyes. It will be followed by a handling session with tactile objects in the Clore Learning Centre, where visitors will be able to explore the past and present life of the Painted Hall. Light refreshments will be provided. Tickets are £5 and admit a blind or partially-sighted person with a companion. Please meet at the welcome desk in the Painted Hall at 10.45am. The closest station is Cutty Sark DLR. If you would prefer to be met at the station please contact the Box Office on access@ornc.org or call 020 8269 4799. A map to get to the site is available. Lift access is available but must be pre-booked by calling 020 8269 4799. If you require any other support, or have other access requirements that you would like to let us know about then please contact us on access@ornc.org or call 020 8269 4799. 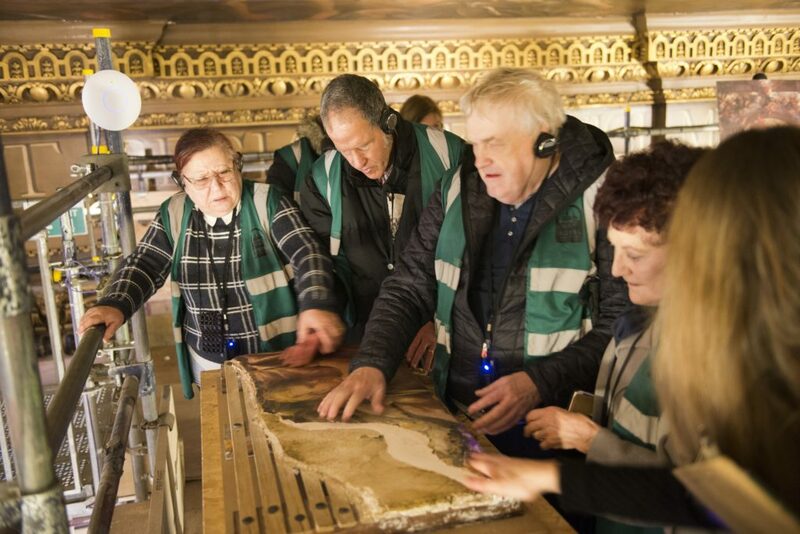 Image caption: participants enjoying a sample panel of the Painted Hall ceiling with its multiple layers, including the painted surface and the plaster underneath.